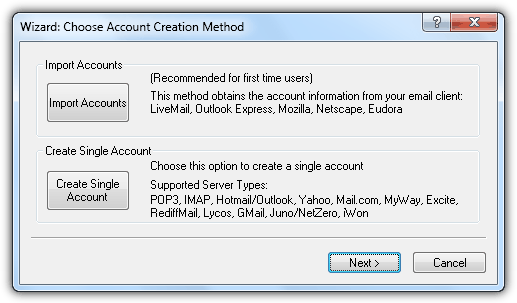 It is common for someone to have multiple email accounts today because most of the time the email accounts are required as the universal login. One example is having a Gmail will allow you to login to Google Docs, Google Drive, YouTube, Google+ and etc. The same goes to your Outlook.com where your account can be used to access public online services such as SkyDrive and Calendar offered by Microsoft. You would also probably have another email account given by your ISP because of your broadband subscription. Finally, if you’re an owner of multiple domain names, you’d definitely create an email account for the domain from cPanel. Having multiple email accounts may be cool but it is no laughing matter if you need to manually check the emails. 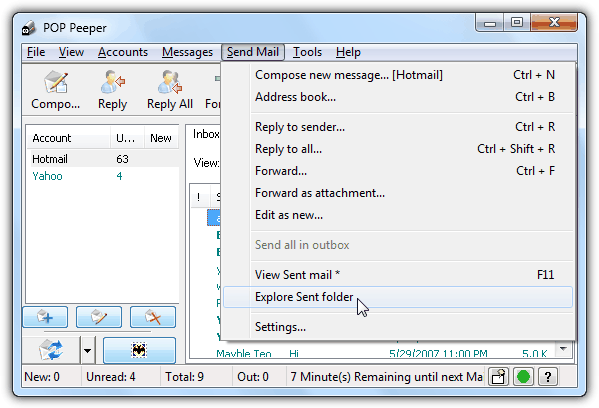 Using a fully featured email client software which can be configured to automatically check all your email accounts may be a bit overkill. If you are looking for a simple, light and easy to use email checker program, POP Peeper is probably what you are looking for. POP Peeper is a free email checking software that can be used to automatically login to multiple email accounts and check for new emails. Other than just checking emails, we were surprised that POP Peeper is even capable of sending/replying emails because most email checking software does not come with such feature. This program has been around since 2001 and is still in active development especially in fixing any bugs for the webmails to work properly. Other than that, POP Peeper is a light weight program that weighs slightly over 1MB in size. Setting up email accounts especially webmails such as Hotmail/Outlook, Yahoo, Gmail, RediffMail and etc are very easy because the server information are pre-configured by default. All you need to do is enter your email address, login name and password in the program and POP Peeper will automatically use the necessary settings based on your email address to correctly login to the email server. Once the accounts are added in POP Peeper, by default it will automatically check for new emails every 15 minutes and the interval can be changed in Options. The program options are very straight forward that can be easily understood by any basic computer user. If you are not comfortable with some of the functions in POP Peeper, they can probably be changed using the Tweak utility. To installer the tweaker, download the file, extract the PPtweaker.dll file to the POP Peeper installation folder. Restart the program, go to Tools and select Run PPTweaker. Some of the tweaks supported are changing of the shortcut keys, global hotkeys, full screen detection, timeout settings, background color and many more. 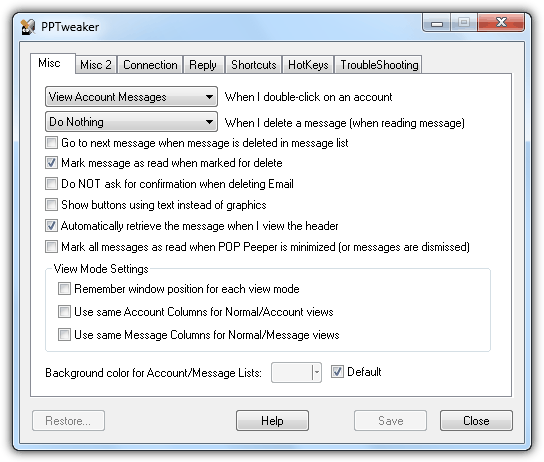 Although POP Peeper is great to use because it is easy to use, support many webmails and is free to use but there are some important features that only comes with the paid premium add-on pack where it supports RSS protocol which is very useful for checking the latest updates on websites, voice notification, viewing of sent emails, backup & restore utility and accessing custom folders such as Junk/Spam/Deleted for certain webmails.You can probably live without viewing of sent emails because you can still access the POP Peeper’s sent folder in Windows Explorer by clicking on Send Mail toolbar, select “Explore Sent folder” and open the .eml files with your default email client or even Notepad. The upcoming major update v4.0 looks very promising because it comes with spam filter, spell checker, WoT integration to check on the reputations on the hyperlinks found in the email body, text searching, auto complete, email hiding capability and some other small enhancements. We would say that the biggest drawback in POP Peeper is the inability to view the junk/spam folder without purchasing the add-on because it is common for webmails to periodically flag some legitimate emails as spam. 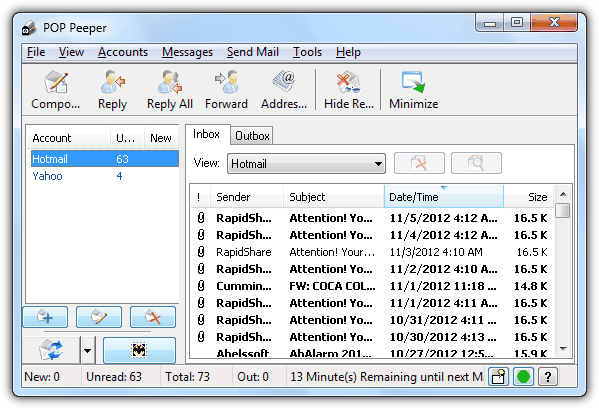 Overall, POP Peeper is a great email checking program to use if you don’t mind spending $10 on the premium add-on pack or living with the limitations without the add-on pack. I use Magic Mail Monitor since over 10 years for 20 mail accounts. In the future I stick with the last Windows Version it runs on. Very good, used it and works great.